Put together some Superdome inspired schedule wallpapers. It's been 4 years since the last ones, but better late than never! There's 4 options in the 3 major time zones. I'm so jacked for this season... Let's go get it! Who Dat! I've got a 3840 x 1080 monitor.... can you hook me up? I've got a 3840 x 10 monitor.... can you hook me up? Awesome, thanks! Got the DB one up as my background. 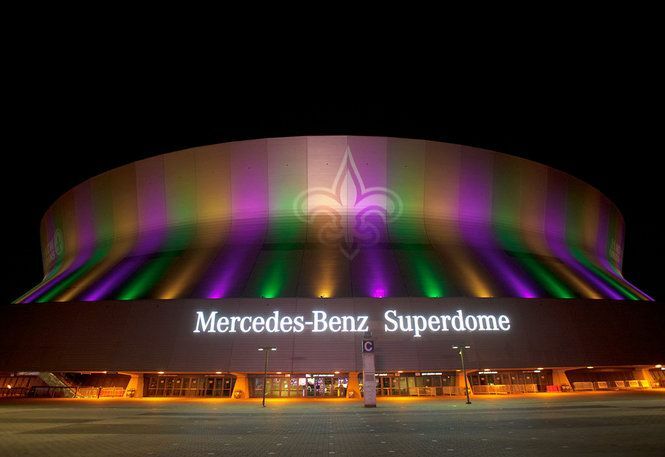 I think one with the Superdome lit up with the Mardi Gras colors would be sweet, too. Nice work! Awesome! Only thing missing maybe is whether it’s a home/away game? These are awesome...Really wish there were more wallpapers being made...for real..
Ah yeah I had the problem of where to put it/how to indicate that without overcrowding everything. I decided to go with a white triangle in the upper right of each panel. Its not clear so probably wasn't the best solution. I'm assuming TKG is meant for Thanksgiving? If so, you got it on the wrong game, it's the week before. The Cowboys game is just TNF.